Great GRE meeting tonight for Tyrone xmsn project! 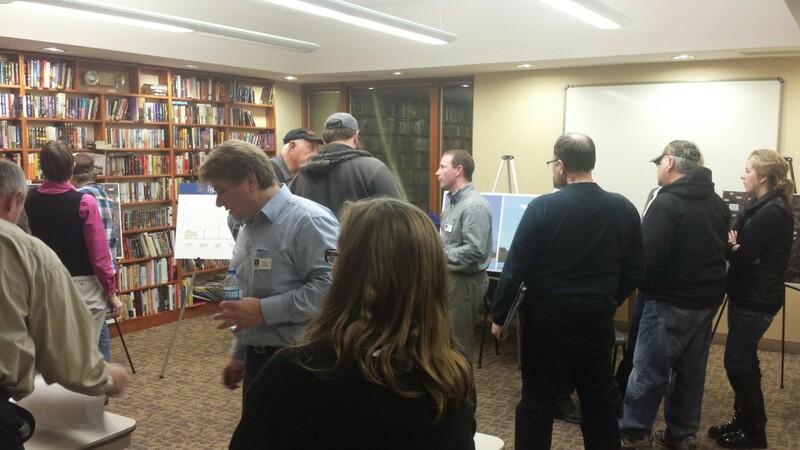 Tonight Great River Energy held a great meeting on the Tyrone Transmission Project, a “little” 69 kV project along Myrick Street in Le Sueur. For such a short project, what a turn out — this was towards the end, when I got there, it was standing room only, down the hall, all the way to the door. Will penta poles leach into the groundwater (10′ well in area!)? If they want to power the currently non-existent warehouse district, why isn’t substation over there? If this is for Cambria, shouldn’t the substation be on their property? About that underground line serving Cambria, what’s up with that? If they’re wanting to serve Cambria and the warehouse district on the other side, why tap into the existing 69kV so far to the east and then run all that way back west, isn’t there a better way to do it? There should be a good article about this in the Le Sueur News-Herald tomorrow or Thursday. 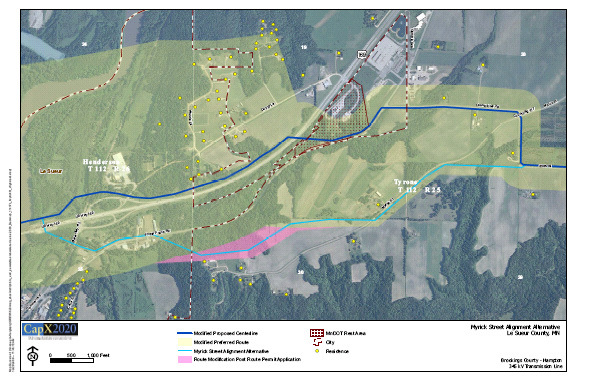 And the GRE Tyrone Transmission Project page! Next stop, Le Sueur County Zoning & Planning for the first step towards a Conditional Use Permit. Are we having fun yet? Remember Myrick Street??? Here we go again! This is a new transmission line proposed by Great River Energy in the Myrick area, just up the hill from the Minnesota River in Le Sueur. Great River Energy is holding an open house on Tuesday! What they’re not mentioning is that this project will require approval by the County, and that application is expected to be filed some time after the Open House. So mark your calendars, and keep an eye out! Posted: Saturday, January 10, 2015 12:42 pm | Updated: 1:52 pm, Mon Jan 12, 2015. Great River Energy and Minnesota Valley Electric Cooperative hold an open house meeting Tuesday, Jan. 27 regarding a proposed 69-kilovolt transmission line and substation to be constructed in the Le Sueur area. The proposed substation would be located near the intersection of County Road 117 and 320th Street and the line would run along 320 Street to 265th Avenue, tapping in to an existing Xcel Energy line at 339th Street. Construction is expected to begin this winter with lines being in service by June 2016. Anyone with questions should visit greatriverenergy.com/tyrone for project updates. The public is encouraged to attend the open house to have questions answered and to provide comments. The meeting is set from 5:30 to 7:30 p.m. Tuesday, Jan. 27 at the Le Sueur Library, 118 Ferry St.
No formal presentation will be given. Remember this map? 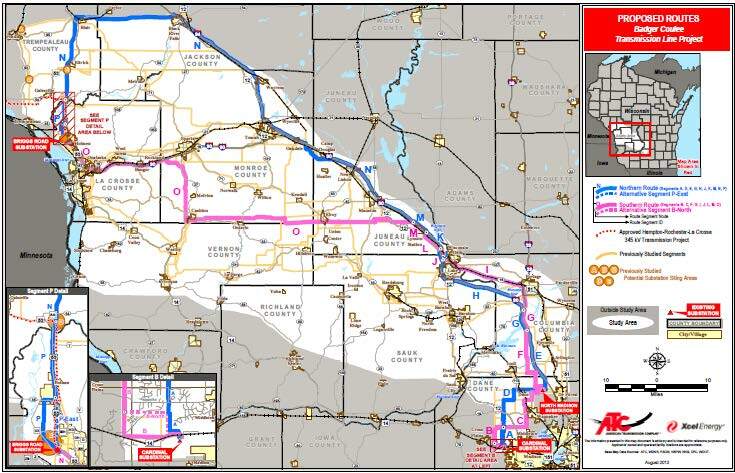 The ITC Midwest MN/IA line is the ITC Midwest part of MISO’s “MVP 3” which on the above map is the red part. The other part of MISO’s “MVP 3” is to be built and owned by Warren Buffet’s Mid-American Energy, and that’s the green line above. MISO’s MVP 3 is one of those touted and promoted by our “friends” at Center for Rural Affairs (oh, what people will do for money!) The tan/orange and blue are what’s known as MISO’s “MVP 4.” And yes, it’s all connected, moving east to MISO’s MVP 5, the northern part of which is Badger Coulee, from La Crosse to Madison, and the southern part of which is the Cardinal-Hickory Creek (Spring Green?) that runs from MVP 4 to Madison. The biggest thing at issue here is whether ITC Midwest is a “public service corporation” in the state of Minnesota. That designation gives it special status, specifically, the door to use of eminent domain, to condemn land for the transmission line. Starting at 9:30, CLICK HERE FOR WEBCAST of the Badger Coulee transmission project technical hearing at the Wisconsin PSC. It started Tuesday, apologies for not getting this posted earlier, had a pipeline hearing in District Court Tuesday and have been pre-occupied… but hey, I’m paying attention now! You can too. Check out out, it’s interesting stuff. 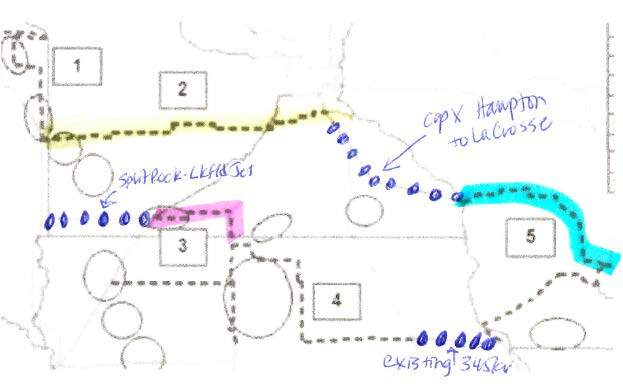 This is the northern half of MISO’s MVP 5, Badger Coulee is the blue line above “5” and the other half of MVP 5 is below “5” and you can see how it’s all connected, connected to CapX 2020 at La Crosse, and connected to MVP 3 and 4 coming across from Iowa and Minnesota, completion of the CapX 2020 link from the mine-mouth coal plants in the Dakotas to the Madison 345 kV ring and points east.